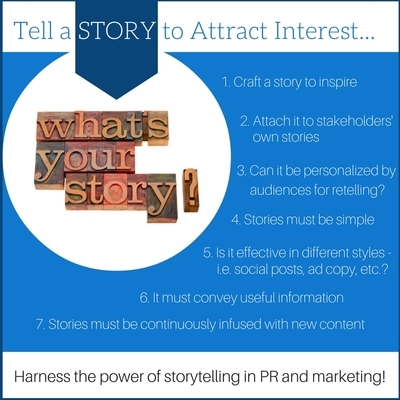 Tell a story and you'll attract attention and interest. Simply present your messages and you'll only elicit disinterest and yawns. Why then do all of us marketing and PR professionals spend so much time discussing messages, managing messages, and getting messages out? I suspect it is because we all know that communications, like any endeavor, requires content and a purpose – and messages are the building blocks for communications. Where we often fall short is in the execution of relaying those messages. The business of high-tech marketing and PR is complex, and the information that we deal with often requires active listening on the part of our audience to comprehend what's being said and then interpret – in real time – what this means to them. An amazing transformation takes place when the same information or messages are delivered in the form of a story. Suddenly a connection is being made, and lasting communication is taking shape. Nothing is better than to hear your story, or pieces of your story, being repeated. This is the art of communicating through human experience. Testimonials and case studies are the most frequent methods that the high-tech marketing world uses to tell a story, and we all know these work very well. All company stories can benefit from being humanized. Heroes and villains are the staple of any good story, and your story deserves a little drama too. Technology challenges, competitor conflict, customers, global issues, regulatory policies, standards, and the like are all good characters for your true-life high-tech drama. Take a lesson from the Wall Street Journal and Fast Company. Both are respected media outlets known for their credibility, timely coverage and great storytelling. Find the novelist within and begin telling your story. I'll be looking and listening for your stories. Until the next blog post, happy storytelling!